When it comes to hair, it’s personal. The way you style behind the chair is your signature, and PRAVANA is here to empower you to create the looks you envision. Introducing PRAVANA’s all-new stylers, designed to be used alone or cocktailed. These 3 new, multi-purpose styling products can help you and your clients create and maintain salon-fresh looks. the most requested yet most challenging salon service that stylists face every day behind the chair. With the ongoing platinum and pastel hair trends among influencers and celebrities, clients are looking to professionals to recreate these looks more than ever. What if it was possible to achieve higher levels of lift while maintaining the integrity of the overall finished look? 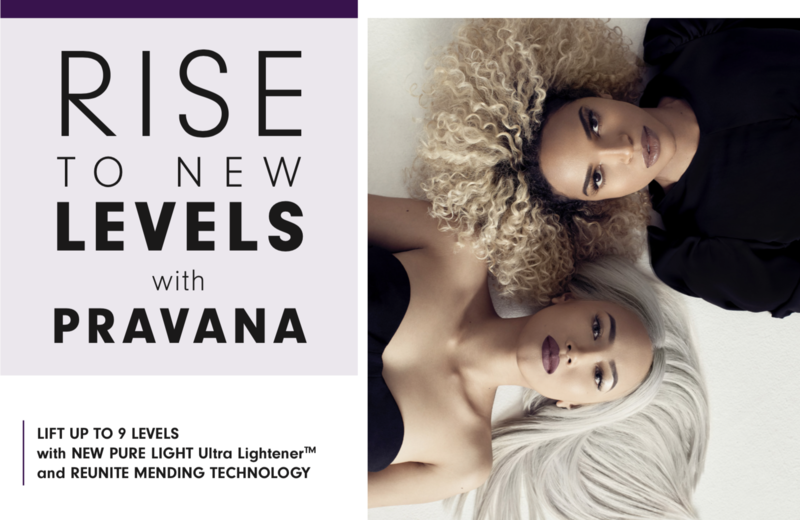 Introducing the all-new PURE LIGHT Ultra Lightener™: PRAVANA’s highest lifting lightener that’s clinically proven to increase shine and softness of the hair. PURE LIGHT Ultra Lightener™ does more than lift; it’s formulated with NEW REUNITE MENDING TECHNOLOGY that restores hair from the inside out. What is REUNITE MENDING TECHNOLOGY? Lightening services work by swelling the cuticle to allow lightener to enter the hair, leaving it in a dry, fragile state. REUNITE MENDING TECHNOLOGY works by depositing amino acids for added internal strength and plant-derived polymers that mend the cuticle layer. The result? Smooth, shiny hair! Since REUNITE MENDING TECHNOLOGY adheres to the inner cuticle layer rather than coating the strand, hair is free of heavy residues that weigh it down! The hair is left with beautiful, natural shine. PURE LIGHT Ultra Lightener™ with REUNITE MENDING TECHNOLOGY works with lightener, not against it so stylists don’t need to factor in longer processing times, plus they have the ability to use their developer volume of choice, making it a must behind the chair. VIOLET: a timeless, inclusive shade adored by the beauty and fashion industries, that clients request and stylists strive for. Whether it’s to neutralize warmth or simply add tone, the demand for high-quality violet products behind the chair is imperative. PRAVANA is ready to equip stylists around the world with the tools they need to conquer the violet realm. 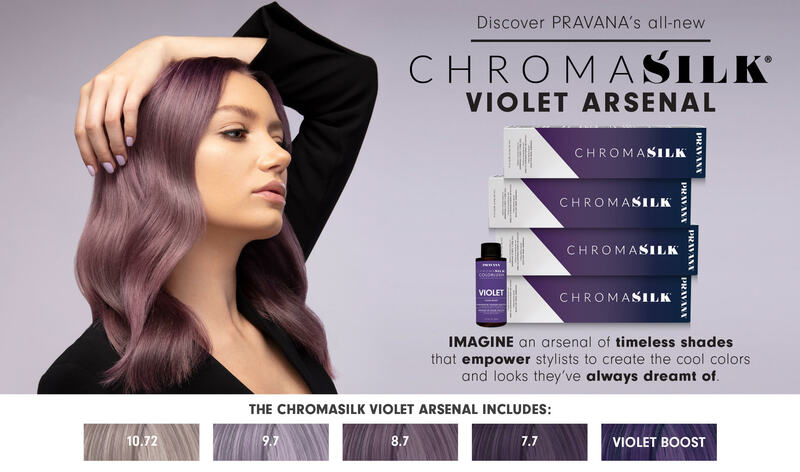 Introducing the all-new ChromaSilk violet arsenal: the highly-anticipated .7 series of PRAVANA’s award-winning ChromaSilk Permanent Creme Hair Color line plus an all-new demi-permanent ColorLush Violet Color Boost. 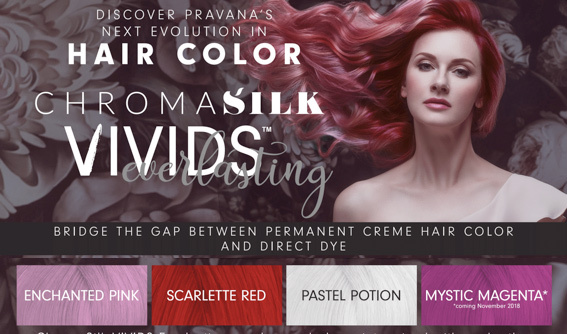 From the professional creative color category creators comes the next evolution in hair color: VIVIDS Everlasting, PRAVANA’s longest-lasting, VIVIDS-like permanent color collection. Available in trend-forward shades made popular by the fashion and cosmetics industries, VIVIDS Everlasting reveals a world of color possibilities with its ability to be used alone, with other VIVIDS Everlasting shades or intermixed with PRAVANA’s expansive collection of ChromaSilk Crème Hair Colors. The new oxidative dye collection contains the same protein enriched base as ChromaSilk Crème Hair Color and has a balance pH for consistent results when intermixing. VIVIDS Everlasting can be used to neutralize, enhance or balance colors to create finishes that don’t currently exist in the ChromaSilk portfolio, Plus, there’s no need to use high lift developers for VIVIDS Everlasting; use 10 Volume Crème Developer for maximum deposit or 20 Volume Crème Developer for lighter, brighter results. 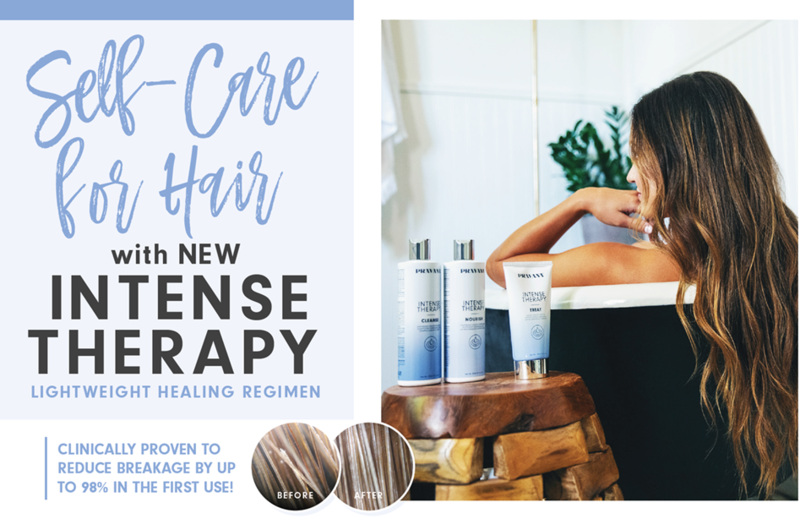 A new 3-piece hair care collection inspired by PRAVANA’s best-selling Intense Therapy Leave-In Treatment that delivers the same iconic scent and even greater reparative benefits. This lightweight formula leaves hair feeling smoother, healthier and more rejuvenated than ever before. 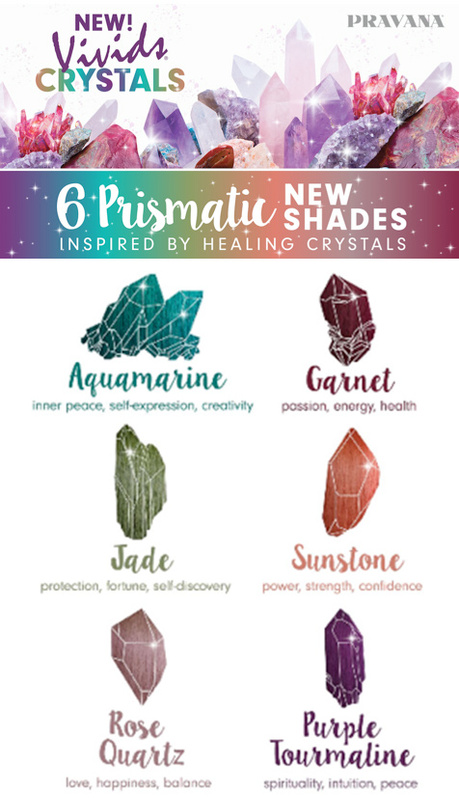 From the leaders in creative color that first brought you VIVIDS comes an all new collection: VIVIDS CRYSTALS, six-dimensional, on-trend shades inspired by healing crystals! VIVIDS CRYSTALS are uniquely pigmented to reflect consistent, saturated tonal value, making it easy to achieve a prismatic look while applying just ONE shade on levels 7 through 10 – just like your favorite crystal! Finally, no need to custom-mix to accommodate for the differences in levels on one client!